Cupcake Eating Contest for Sugarland Tickets! By cupcakeSerenity on June 10th, 2010 . Filed under: Bakeries, Contests, Cupcake Ideas, News . Oh My Cupcakes! 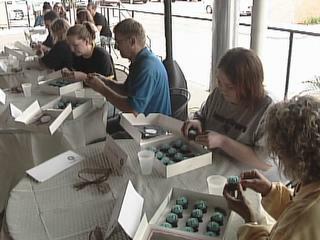 of Sioux Falls, South Dakota, sponsored a cupcake eating contest on June 5th. Oh My Cupcakes! is Sioux Falls’ first and only gourmet cupcakery. Contestants were challenged to eat as many cupcakes as they could in 30 seconds. The five winners each received a sugar buzz and a pair of tickets to see Sugarland in an upcoming concert.